E. Suter was a lens and camera maker, founded in 1878 in Basel, Switzerland. It was the first factory size camera business in Switzerland. 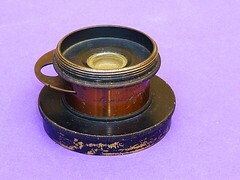 Suter made cameras and lenses, and imported goods from other makers like Mackenstein, Paris. Emil Suter designed and manufactured brass barrel lenses, based on his own patent of 1900, comprising an eight element two group design. Another product line where licensed lens types like Paul Rudolph's original construction of the Anastigmat for Zeiss, the Protar. A further of Rudolph's lens constructions made by Suter was the Doppel-Plasmat. Suter's Reisekameras were of the well established tailboard constuction Continental View type. The Swiss-Box and the Detectiv Magazin camera were quite individual constructions. The Cupido was a 9x12cm plate camera, a unique construction with self-erecting bellows. This invention seems to have been shared with Hüttig, even the name Cupido was also given to such 9x12 cameras of the camera maker from Dresden and its successor Ica. Suter's and Hüttig's Cupido were different except their use of the same bellows unfolding mechanism. Suter page at Collection G. Even's site. This page was last edited on 18 December 2017, at 08:53.